Thanks to modern dentistry, dental implants have quickly become a comprehensive restoration solution for individuals seeking to replace missing or extracted teeth. At the Alexandria practice of Dr. Leo J. Rosenthal, patients can complete total implant treatment. From the initial consultation and preliminary treatments to your final placement check-up, Dr. Rosenthal is committed to exemplary dentistry and successful implants. 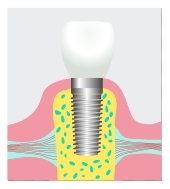 Dental implants are a contemporary way of restoring the mouth to full functionality and improved aesthetics. The restoration is comprised of three unique parts- the titanium post that is surgically placed into the jaw bone, a porcelain crown which sits above the gum line, and the abutment which connects the two components. Both the post and crown play a tremendous role in ensuring patients receive truly comprehensive restoration. For example, the placement of the implant into the jaw does more than stabilize the implant. During the placement recovery process, the prosthetic tooth root becomes part of the jaw as it integrates with the bone via the process of osseointegration. Through this process, the structure and health of the bone is reinforced, thereby creating a stable base for the rest of the implant and preventing surrounding teeth from falling out. Similarly, the crown part of the restoration contributes to the functionality and cosmetic appearance of the smile. By replacing the missing or extracted tooth, the crown prevents the surrounding healthy teeth from shifting into the empty gap, potentially damaging the alignment of the patient’s smile. Additionally, dental implant crowns are often made of porcelain, providing patients with a highly durable replacement tooth. Additionally, the versatility of this treatment makes dental implants a viable tooth replacement solution for a wide range of patients. In addition to single-unit implants, individuals seeking multiple tooth restorations can complete their smiles through total mouth rehabilitation. During this multi-step process, sets of implants are used to secure overdentures or support full dentures, providing patients with a stabilized set of replacement teeth. When compared to traditional restorative dental care, dental implants offer a number of advantages that go well beyond completing your smile. The integration of the implant into the smile ensures that patients receive a permanent restoration that does not require frequent replacements as seen with traditional restorations. In the event that the crown breaks, patients do not have to worry about replacing the entire restoration, as they would with dentures or bridges. Patients can simply visit our dentist office for a same-day replacement crown and return to their routines immediately following their appointment. Given the long lifetime of this contemporary treatment, dental implants are considered to be a long-term investment into a patient’s overall health. Where dentures and bridges may negatively affect your dentition over an extended period of time, dental implants contribute to your overall oral health and provide long-lasting dental function. With over 17 years of preparing, placing, and restoring dental implants in his Alexandria dental office, Dr. Rosenthal offers comprehensive dental implant care. By utilizing advanced technology such as CBCT imaging and digital x-rays during the treatment development phase, Dr. Rosenthal creates treatment plans that accurately and precisely determine the placement method. For patients requiring preliminary treatments, our practice also offers extractions, bone grafting and socket preservation, eliminating the need to visit multiple specialists for just one procedure. Our Alexandria practice is committed to exemplary dentistry through all phases of dentistry. 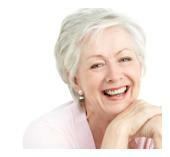 For more information about the long-term benefits of dental implants, please visit Dr. Rosenthal today. Leo J. Rosenthal has been the Reichardt family's dentist since 1998 when we moved into the Washington DC area. Leo's passion for dentistry and love for his patients makes us feel like his family. My daughter continues to schedule her regular check-ups with Leo's practice during her college breaks. She won't go anywhere else. Not only is Leo an outstanding dentist, but his staff is knowledgeable and friendly. Together, Leo and his staff provide outstanding dental service in a warm and caring environment. My wife and I have been going to Dr. Rosenthal since 1998. From our first visit we were not only impressed with him and his staff, but we were also impressed that he used top-of-the-line technology. Over the years he has performed root canals, installed crowns and implants along with extractions and general dentistry using state of the art technology. In every instance he and his staff have always been professional and their work exceeded our expectations. His skills are only enhanced by his warm friendly manner and genuine caring for his patients and he is always there when you need him. If you are looking for a top notch dentist who uses the newest technology and really cares about his patients, we recommend Dr. Rosenthal and his staff.